If the heavyweight scene is the best test of the health of boxing then the sport is on life support. The post-Lennox Lewis landscape is a desolate one, littered with one-time prospects, raiders from lower weights and obligatory great white hopes. BBC Sport casts an eye over the fighters hoping to administer the kiss of life. Vitali Klitschko (won 33, lost 2) was ahead on points before being stopped on cuts in Lewis' last fight and at 6ft 7in and 250Ibs is a frightening proposition for anyone. The elder Klitschko bounced back to destroy Kirk Johnson last time out and is on a collision course with Corrie Sanders for the vacant WBC crown. 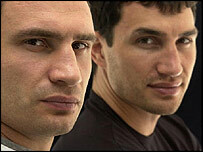 The 27-year-old Wladimir (42-2) is a more stylish perfomer with time on his side but Sanders had him down four times in 2003, raising serious questions about his chin. This rugged South African can bang a bit, as his second-round knock-out of Wladimir Klitschko demonstrated. 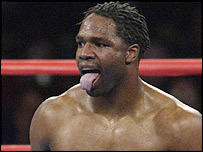 However, the limited Hasim Rahman stopped Sanders (39-2) back in 2000 and at 38, his touted clash against the monstrous Vitali Klitschko could be his last shot at the big time. The slightly-built Byrd (37-2) is a tricky southpaw nobody wants to fight - but the IBF champion had a close call against Puerto Rico's Fres Oquendo last time out. The 33-year-old beat Evander Holyfield in 2002 to claim the vacant title and also has wins over New Zealand's David Tua and the elder Klitschko on his CV. But the signs are that "Rapid Fire" lacks the necessary power to dominate the division and Wladimir Klitschko battered him when they met in 2000. It is a sign of a weak heavyweight division when middleweights come sniffing for spoils. Roy Jones Jr (49-1) became the first former middleweight champion since 1897 to capture a heavyweight title when he outpointed John Ruiz last year but has shown no inclination of defending his WBA crown. And the 34-year-old's one fight since, a controversial decision over Antonio Tarver at light-heavyweight, suggested he was a fighter on the slide. James Toney (67-4) battered a pathetic Holyfield last October and was set to fight the massive Jameel McCline before injury intervened. "Lights Out" is a more natural heavyweight than Jones and brings charisma to the table, but at 35, is hardly the division's future. Britain's much-lampooned Olympic champion would be the division's long-term future were it not for the fact that, at 32, he is almost as old as both Toney and Jones. 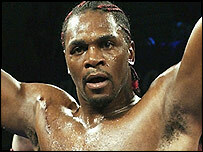 Harrison (14-0) is taking things slowly but should return from America this year to begin mopping up the domestic scene. His stated aim is to be world champion by the time he is 34 - the age most boxers start thinking about hanging up their gloves. Lack of decent opposition so far makes it difficult to assess whether he has the tools to achieve his goal. The last five years have seen the one-time superstars of the future cancel each other out leaving no obvious successor to Lewis' crown. Who's the next heavyweight superstar? Tua, Rahman and Ruiz have proved time and again they are decent fighters, but nothing more. "Baby" Joe Mesi, although of limited ability, fulfils America's need to have at least one "great white hope" in the mix. The fact that 37-year-old Mike Tyson remains the biggest draw for most casual fans is the best indication as to the state the division is in.